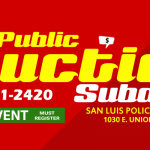 The San Luis Police Department offers a challenging opportunity to men and women desiring to become a volunteer reserve officer with the Department. Reserve officers perform a valued service in a wide range of activities dedicated to protecting the lives and property of City of San Luis residents. Sworn Reserve Officer applicants must complete and submit an application. All volunteer Sworn Reserve Officers must be at least 21 years of age, or will be 21 prior to graduation from an approved law enforcement training academy. All applicants must furnish a copy of their high school diploma (or G.E.D. ), birth certificate, have a valid driver license and/or other form of identification and successfully pass a physical fitness test, written examination, extensive interview, background investigation, polygraph examination, drug-screening, psychological and medical examination. In addition, you must be a U.S. Citizen. 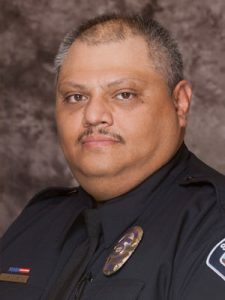 The San Luis Police Department does not allow its Officers (full-time or reserve) to have separate, full-authority peace officer employment/sponsorship with any other law enforcement agency, either in or outside the State of Arizona. Applicants must pass the written examination with a minimum score of 70%. All aspects of the testing process are subject to verification through the background investigation and polygraph examination. All reserve officer applicants must complete a psychological evaluation to determine suitability and a comprehensive medical evaluation provided by the Department at no cost to the applicant. Reserve officers must complete training equivalent to that received by full time officers [585 hours of training] and be certified by the Arizona Peace Officer Standards and Training Board (AZPOST). Reserve officers must complete training through an AZPOST accredited law enforcement officer training academy. These academies are operated at several community colleges throughout the state. Classes are normally held during evenings and on weekends and the complete training course can be completed in approximately ten to twelve months. Please be advised the cost of the basic training academy, and certain associated equipment, is the responsibility of the Cadet. The San Luis Police Department provides the following items to its Sworn Reserve Cadets and Officers: 1) Duty weapons (firearm and Taser), ammunition, holsters and magazine pouch; 2) Duty belt and related accessories (handcuffs and case, OC spray and case, police radio and holder); 3) Badge and police credentials. The Department also offers advanced officer training courses to its Sworn Reserve Officers. Within one year of graduation, all reserve officers are required to complete the field officer training program. Continuing officer training is also required annually. Salary: Reserve volunteers are not compensated for their services to the Department nor are they eligible for state employee benefits, except for Workers’ Compensation under ARS 41-1718. Uniforms: Reserve officers wear the same uniform and use the same equipment as full-time officers. Reserve officers purchase their own uniforms. However, they are issued one uniform for graduation. Specialized equipment is provided by the Department at no cost to the officer. Work Hours Requirements: Following completion of field training, reserve officers must contribute a minimum of 240 hours per calendar year (20 hours monthly). Please contact Reserve Program Coordinator Sergeant J. Sauceda or Reserve Liaison Corporal A. Guevara for additional information on current testing opportunities. Apply by clicking on the link below. If you have any additional questions, please contact the Department’s Reserve Program Coordinators or Reserve Liaison at 928-341-2420.